Dr Simona Carbone is a research fellow in Drug, Discovery and Biology at Monash University. 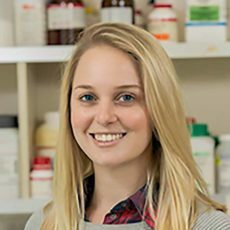 Her current research utilizes techniques in molecular pharmacology and cell biology to study the role of various receptors in the gastrointestinal (GI) tract. With Dr Daniel Poole and Dr Nicholas Veldhuis, they aim to develop a scientific program that designs therapeutics for the treatment of various GI-diseases by targeting physiologically relevant targets. Simona’s research has utilized many techniques from various tissue pharmacology assays, intra and extracellular electrophysiology, immunohistochemistry and in vivo assays to study colonic motility. She is a highly skilled electrophysiologist and first author of 2 papers using electrophysiology to study human myenteric neurons in specimens of colon, this represents half of the total literature on the topic.